It’s now been changed into this video which was on all news bulletins yesterday and has been subject to a considerable amount of negative reaction (as well as those who love it). When I heard about it I was prepared to hate it and get outraged….but in many ways I thought it was excellent. There is a view of masculinity which is harmful and needs to be challenged. I think that the advert does that well. It’s far too easy to dismiss it as ‘woke’ advertising, virtue signalling and toxic anti-masculinity. The themes of misogyny, bullying and sexual misconduct are serious and should not be lightly dismissed. In fact they should not be dismissed at all. Men are generally physically stronger than women, which is why the majority of physical abuse is done by men. Men in most societies have more social, political and economic power. That too is far too often used to abuse. And that can be as true in the Church as in the rest of society. In fact in the church it can sometimes be worse because the Bible is used to justify bad behaviour and attitudes. We need to ensure that the name of God is not blasphemed amongst unbelievers because of the wrong way in which we behave, and the misuse of the Bible that is used to justify that. 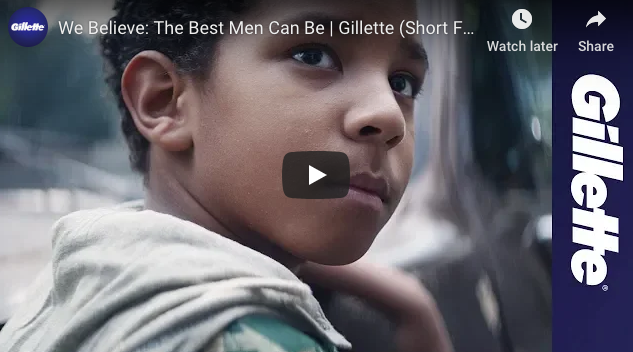 So good for Gillette – but… (and you knew a ‘but’ had to be coming)…there are things that are deeply disturbing about this advert. Firstly. This is an advert for a product. The earlier advert spoke about ‘the best a man can get‘, today’s speaks of ‘the best a man can be’ – as if a product, or a multi-national company can inspire or make us to be the best. The commercialisation of morality and its use to make money is profoundly disturbing. Are we really now taking our morality from the multi-nationals? Gillette are not being brave by their woke virtue signalling – they have been granted millions of pounds worth of free advertising because the name Gillette was on every news presenters lips. Controversy sells. So does virtue signalling. Secondly its hypocritical. Gillette is owned by Proctor and Gamble, one of the major world corporations. They are famous for their animal rights testing and their use of child labour. They exploit people and then exploit our emotions in order to make money. The fact that they are now exploiting the MeToo movement should not be a cause of celebration. Greed is more of a problem in society than ‘toxic masculinity’. The advert is also racist. You will note that of the 43 bad examples of male behaviour, 42 are by white men and one black (where are the Asians and Arabs?) . There are seven examples of good behaviour, five of whom are black and two are white. Imagine if it was the other way round! The ad would be banned for racist stereotyping. The unholy trinity of modern Western society is white, working class, and male. In essence then I think the advert itself identifies a problem and suggests an outcome, but doesn’t tell us how we can get there. Using Gillette blades and shaving off our beards is not going to make us ‘the best a man can be’. Let’s see Gillette put that one in their next advert! Your challenge to Gillette is spot on! When you say follow Jesus Christ what exactly do you mean by this and can you give several examples. The reason I ask is there are a number of highly questionable commands the character apparently utters in the bible and I wouldn’t want to misrepresent the things he is claimed to have said. Funny, I’ve been studying it for 45 years, along with the commentaries of linguistic experts & historians who provide invaluable insight into those vital cultural & historical aspects of what the Bible reports, & I’m not aware of any. Of course, I’m aware of the criticisms of lazy atheists & skeptics, who read the Bible as though they’re reading the Guardian, & take zero interest in what those experts on the subject have found, but you wouldn’t be one of those, would you? So, without you providing any evidence for your claim, I’m forced to to assume that you are. Kim you write as if these “experts” on the bible all agree and find the same message and reach the same conclusions and we all know just how much agreement there is amongst Christians. Bart Ehrman would have to be described as an expert on the bible – do you agree with what he has written on the subject? Criticism of the bible often elicits this vaguely irritating response of “Oh if only you approached the bible this way…..”…. or that it’s truth can only possibly be discerned by a particular reading that atheists are apparently incapable of or just unable to understand because they have no faith (which makes you wonder just what good the bible is as a means of attracting people to the apparent truth of Christianity). How has your 45 years of studying the bible made the idea of a resurrection any more likely to be true? It’s notable that you focus on the notion that “these “experts” on the bible all agree” but that “we all know just how much agreement there is amongst Christians”, yet ignore the REAL issue here, that “lazy atheists & skeptics….read the Bible as though they’re reading the Guardian, & take zero interest in what those experts on the subject have found”. So let me unpack this. First, you make a category error between the centuries of scholarship on the issues I mentioned, “the commentaries of linguistic experts & historians who provide invaluable insight into those vital cultural & historical aspects of what the Bible reports”, & theological differences. Second, the overwhelming majority of those differences you sarcastically note, are most often centred on minor points of doctrine, not the essentials, which can be summed up in the Creeds. As a famous adage from many centuries ago instructs, “in all things essential, unity, in all things peripheral, charity, & in all things, love”. Third, to make such errors causes me to wonder whether you are actually just another one of those lazy atheists & skeptics I described previously. “Bart Ehrman would have to be described as an expert on the bible – do you agree with what he has written on the subject? No, & neither do the majority of Biblical scholars, for example his own teacher, Bruce Metzger. From the tone of your question it’s clear that you doubt the possibility that it is, so I take it that you think you have enough evidence that it couldn’t be true? Is that correct? Perhaps it is your own obvious pleasure in the use of sarcasm that gives you such a finely tuned ear in detecting its apparent use by others. Not sure and I don’t suppose it matters. How much attention do you pay to those experts? The same amount as myself I think. It sounds very much as though you think everyone would fall under the spell of your religion if they would just read its text in the right manner or lend an ear to the findings of the experts. If only it worked that way. I will cheerfully confess that the thought of spending 45 years studying a single book (though quite what you mean by “study” is anyone’s guess) strikes me – a lover of books, writing and reading – as a little obsessive. There are many books which I think of with pleasure and admiration but 45 years on one? Not for me but knock yourself out. I haven’t read very much of the bible at all. I’m quite happy to say that I really don’t imagine for a single moment that it would change my view on the truth of Christianity at all. I have read numerous books on religion and believe I wouldn’t be exaggerating to say that I have listened to hundreds of hours of debates, talks and discussions on the subject online. That is how I have come to my position as an atheist and I’m extremely comfortable with it. I have approached the subject seriously and with great interest. I still am very interested in religion, but more as a social phenomenon. I understand that it doesn’t please those who have faith but I expect the truth about a large percentage of atheists (the thinking ones) is that if the proof for the truth of a god really was out there then we’d be amongst the first in line to sing his praises at church. This isn’t my experience of atheists, John. The opposite seems to be true because most atheists hate the God of the Bible, usually because of His judgmental nature and His willingness to destroy people, and they usually quote parts of the Old Testament (and there also sometimes underlying emotional reasons such as bad experiences through life or in a particular church). Then when asked what they would say to God if they met Him face-to-face, they [think they] would essentially say ‘How dare you do such things to your own creatures?’ However, as far as I’m concerned, that simply indicates that the god they don’t believe in is far smaller than the real God of the Bible – in fact he’s so small that he’s smaller than themselves. Also, do think about what you just said. If proof for God really was out there, then we would all HAVE to sing His praises at church. But God isn’t like that, He gave us freedom – freedom to disbelieve or believe, and He gave us enough information, through the glory of His Creation, the Bible (which I suggest you DO read) and the life, death and resurrection of Christ, to show us His glory; but He cloaked Himself in invisibility sufficiently to allow those who refuse to believe, to do as they wish. Except for one important factor. The Koran is not a book which reports any kind of historical occurrence in the same way that the Bible does, & especially over the grand sweep of at least 2,000 years of that history, & across multiple cultures & languages, Also, ask any Muslim & they’ll tell you that to get the full impact of the Koran it has to be in Arabic, so they dismiss much commentary from speakers of other languages. So when you say, “How much attention do you pay to those experts? The same amount as myself I think.”, you’re only knocking down a straw man. Also, you repeatedly print the word experts in inverted commas, as though you challenge the correctness of such a designation. So please tell me, how would you define scholars who have the widest knowledge of their own subject other than as experts? Another straw man. Where do you get such a notion? Or is it just more of your sarcasm? No, because you’re already biased towards any notion that it could be true. Well, isn’t that just dandy (pardon my sarcasm)!! But there’s only one problem there. No religion is designed to be a “social phenomenon”, especially Christianity. So any deductions you arrive at are essentially irrelevant to the reality of what Christianity actually is, which means that the further you go from your initial deduction, the further you go down the rabbit hole. No, what doesn’t please people of faith is when atheists think they’re “the thinking ones” (yes, I did mean to be sarcastic this time), yet show such willful ignorance of Christianity, yet come to blogs like this & pontificate & denigrate those who’ve studied it in great detail, while claiming to understand it well, though they’ve merely read books about it & engaged in debates while treating it as though it were nothing more than a social phenomenon that can thus be explained away from a studied distance. And there’s nothing as irrational as a finite person demanding proof from one who’s infinite, but being willfully ignorant of the claim that such an infinite Creator has, in fact, communicated meaningfully through history, but can’t be bothered to treat it as anything more than a “social phenomenon”. Sure doesn’t take much thought to be a “thinking one”, does it! So tell me, is he one of your “large percentage” of “thinking ones”, or is he something else? In my experience, he’s just a typical skeptic pushed to the logical conclusion of his skepticism, which is used as a force field to ward off any idea which contradicts their precious worldview. I say “precious”, because it’s so reminiscent of the blinkered, destructive fixation of Gollum with the Ring of Power in the Middle Earth books of Tolkien. So I don’t know if you deem all skeptics & atheists to be “thinking ones”, but if not, I don’t know where or how you draw a line between those who are & those who aren’t, & frankly, any attempt to me would seem arbitrary. The fact that you admit to being so unfamiliar with the chief textual source of Christianity, yet claim that’s OK because you’ve read lots of books & watched lots of debates is like saying you know Theresa May because you’ve read her bio & watched lots of Question Time in Parliament! “Thinking ones”? If that’s your definition of “thinking”, then you really need to think again!! Yet you dismiss it with a blithe wave of the hand? It’s by challenging ourselves to follow Jesus Christ that we can get closer to HIS best. When you say that “the majority of physical abuse is done by men”, there is a danger that readers will think that you are referring to intimate partner abuse, i.e. physical domestic violence amongst couples. If that was your intention, then you are wrong in your assertion, let alone the reason for any of the non-existent correlation asserted between maleness and any “physical” domestic violence perpetration often insinuated by feminist sources. In some studies, the majority of intimate partner physical abuse is measured to be done by women, not men. However, the best approximation across many academic, properly conducted, non-feminist studies and official statistics is probably that the ratio of male to female perpetrators of physical intimate partner abuse is roughly equal. The violence is not highly “gendered” as you suppose. That is a myth. The superior strength of men is probably the reason for one observed phenomenon though, albeit not the one you allege mistakenly is observed. In cases of extreme, mutual, lethal domestic violence, in which tempers are lost and a fight to the death ensues between a man and a woman, the deceased is more often the women, the man escaping with lesser injuries. However, although mutual domestic violence is more common than domestic violence with a clear sole aggressor and a clear sole victim as narrated by certain feminist groups, which groups typically refer to domestic violence as “gender violence” for propaganda purposes, lethal domestic violence of any sort accounts for only a tiny proportion of the physical incidents that meet the definition of domestic violence. I believe that the opposite of what you say may be true. It is because of the average superior male bodily strength of males that males are socialised not to use violence against women at all, even when they ought to, even to the extent that they are even ashamed and therefore reluctant to defend themselves against lethal attacks perpetrated by women. Thank you for stating this point so well. that was the thought I had too when reading this. Not only that, but men who are attacked by women are perfectly aware that if they lift a finger in self-defence, and inflict any injury on the woman attacking them, the woman will call the police, who, on their arrival will see a man and a woman with injuries because they have been fighting, apply the feminist gender stereotype, arrest the man, and charge him with assault. All the man can do to avoid this is simply stand there like a punchbag. Justice? Like hell it is. Erudite and balanced, if not comprehensive (nor was it meant to be) as John Allman highlights. I’ve read that abuse of men in a marriage is greater, in numbers, than vice versa, though I don’t have the source, and stand to be corrected. As a man with a beard, I don’t come within the scope of the ad. I would say the ad is massively oppressive to women and deeply disrespectful. Standing on the shoulders of women who have spoken out – maybe after years of silence – about something very personal and something which women are particularly vulnerable to – sexual abuse, exploitation and physical violence – in order to sell razors to men! As the subject of religion which you have approached very seriously and with great interest is of great interest to me too, could you, if you will; kindly expand a little on what your angle of interest is? For instance, is it from a social science perspective? That is; from the perspective of a social scientist? And is Christianity a religion in which you are particularly interested in as an atheist? As you quite understandably might not wish to engage any further in this discussion, please know that my angle of interest is from a social science perspective. Previously to taking an interest in the religion of Christianity, my field of interest from a social science perspective was in Disaster Research, principally on the question: What is a Disaster? And, it hardly needs to be said, determining what a disaster is requires very considerable study of disasters as a social phenomenon and, paradoxically, the rejection of the view the first-responder community takes of disasters. Of particular interest to me now, however, is the question: What is a Christian? The question arises first all because of the existential problem of Identity and secondly because there is considerable confusion and doubting about what a Christian is, especially and paradoxically within the Christian religion itself. In all evidence, what Christians today “know” about themselves in Christianity is as questionable about what the first-responder community knows about itself in disasters, that is; it assumes its members are the first to respond, but actually they are not, and if the social phenomenon of disasters is admissible, then the first responder community in disasters is a community of late-responders initially equipped without what it takes to respond to disasters properly. It is a bit like what often goes on in these posts, specifically: front line Christians responding to atheists inadequately, that is; with the Bible instead of with faith, hope and charity (I Cor. 13). I am, however, not in the least interested in fruitless debates although these, as inconsequential as they are, unfortunately do exist. My appeal to you simply is founded on the perspective of studying social phenomenon and it is addressed to you because you write “I have read numerous books on religion and believe I wouldn’t be exaggerating to say that I have listened to hundreds of hours of debates, talks and discussions on the subject online”. Thank you for your kind attention and for any eventual response you may give to my query. Next Next post: Why is There Chaos in Parliament?